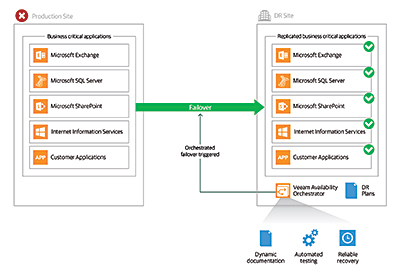 New arrival: Veeam Availability Orchestrator for BC/DR compliance « Tech bytes for tea? “Customers are looking for innovative solutions not only around backup, but those that emphasize replication and speed of recovery. With Veeam Availability Orchestrator, organizations will be able to orchestrate their entire DR strategy, frequently validating that their plans will actually work in a disaster, through automated documentation and testing. They can easily report on key metrics to C-level executives and stakeholders, making it much easier to comply with regulations and audits in industries like healthcare,” said Michael Vencel, executive vice president of Comport Technology and Healthcare Solutions, a Veeam Cloud Services Provider (VCSP). Built with enterprise-class Availability in mind, the new Veeam Availability Orchestrator provides a DR orchestration engine for Veeam Backup & Replication replicas. Satisfying compliance requirements with template-based documentation that makes it easy to build and update DR plans as the virtual environment changes. Proving recoverability at any time through automated scheduled and on-demand plan testing and readiness checks that have zero impact on the production environment. Ensuring IT service continuity through the reliable execution of multi-site DR failover and failback, including service and application verification. Veeam Availability Orchestrator is now available to customers with a Veeam Availability Suite or Veeam Backup & Replication Enterprise Plus license. This entry was posted on Wednesday, February 28th, 2018 at 11:00 am and is filed under Announce, Availability, Business IT, Launch, Press Release, Software, Specifications, Veeam. You can follow any responses to this entry through the RSS 2.0 feed. You can leave a response, or trackback from your own site.